Many Many Many thanks to all who have supported us in this important mission! Your donations, as well as your purchases of our Memorial Pavers, Memorial T-shirts, pins, hats, flags, bumper stickers, etc, and your participation in functions and raffles, has brought us this far. Please continue to support us by spreading the word - we want to break ground and get this beautiful and well deserved Memorial built! We have raised over $79,000 - CAN YOU SEE THAT LAST BEND JUST AHEAD? please help us finish this important mission!! The Planting of the Sign !! Please join us for coffee and donuts and celebrate the planting of the sign! Ron Stevanus, Memorial s signage Artist has outdone himself this time with the sign he crafted. Ron is also brother to Larry Stevanus, Treasurer. Thanks Ron! Many Thanks to Sgt. 1st Class, Nelson Dunfee, Jr., who stepped up to help the Memorial in a big way! Sgt. Dunfee of The National Guard Armory in Lorain is hosting a big indoor rummage sale for the Memorial. Get a head start on your spring cleaning and help out the Memorial at the same time! We are looking for clean, gently used items to sell and big hearted, smart shoppers to buy ! 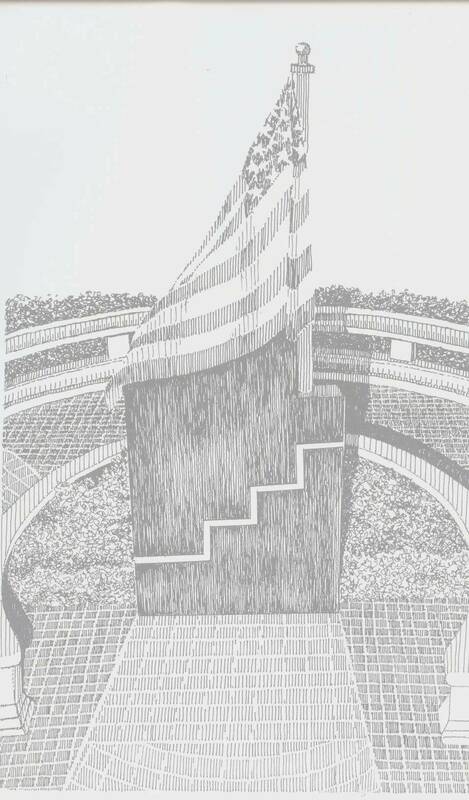 Donations: If youd like to donate items to sell to benefit the Memorial, please Call Don Attie at 440-288-7030 to arrange for drop off no later than Tues. April 20 please. Thanks for your help! This sale offers a chance to donate double! You can donate merchandise for a worthy cause. AND you can come to the sale and pick up some great deals of your own- and its still going for a great cause! Either way , youll be helping 98 Men Fathers, Sons, Brothers, Uncles, Cousins and friends from our own backgrounds. Youll be helping them receive the recognition they so well deserve. A big THANK YOU to Dan Anthony from LCADA Lorain County Alcohol & Drug Abuse Agencyfor providing us with much needed space to store sale items prior to event. THE EAGLE S HAVE LANDED !! Don Attie and his partner in crime Vince Contini were drumming up Have A Heart Sales on Oberlin Avenue last month when they stopped in Dom & Luigis Barber Shop. As they made their way around the shop, they came across Bill Madaras, 3rd Trustee from Aerie 1442. Bill sayshey why dont you bring the Memorial Model to our Aerie meetingI think theyd be interested in your mission! A few days later Don and Vince did just that! Don presented the model, and explained the important mission for Lorain County's 98. The membership was kind, attentive and seemed very receptive to the Memorial. When Don finished, he and Vince stepped into the hall while the members discussed his presentation. Being the fun loving characters that they are, as they awaited the outcome, they were jokingly betting each other on the Aeries decision. Now of course any donation is great but at the same time they were hopeful of a $500-or maybe even $1,000 donation. Both men went a bit weak in the knees when Mr. Madaras came out and announced that Aerie #1442 would like to make a $10,000 donation to the Memorial!!! When Don called a little later, the first words out of his mouth were Youd better sit down!! and he was absolutely rightI still get chivvies just thinking about it! Don and Vince swear that it was divine intervention!! They may be rightseems like it was just meant to be that the guys picked the same day and time to stop in Dom & Luigis that Bill picked to get one of his infrequent hair cuts. we cannot express how much this donation means to the Memorial! You may not have heard any news recently about the Vietnam Veterans Memorial of Lorain County but let me tell you, we've been movin and shakin over the last couple months! Not only to keep warm, but to keep that money rolling in in hopes that we can break ground come spring! We had some other really cool winter campaigns that hit the streets in January! Convenient Foods Donation Canisters is one of these! In about a month's time, over $600 has been raised - and the canisters are still out there! They are not only raising awareness of our mission - and that is priceless! In addition to buying the canisters for us, and placing them in 22 of their stores, Convenient has been placing a large headline at the top of their weekly circular - asking for support of the Memorial! Again - priceless! Thousands of thank yous go out to Jerry Latimer and Convenient! For those wondering about the Valentines Day Sock Hop, we apologize that it didn't happen. Many thanks to Avon VFQ Post 7035 for trying to help us out - and we'll try again in warm weather - this time with a car/bike show! If you come across one - please drop what you can in the canister. The HAVE A HEART Campaign was a huge success!! Over $1300 was raised for the Memorial! Huge THANKS go out to the many merchants who participated in our first Have A Heart Campaign. I say first because some of these awesome establishments want us to do it again! Stay tuned cause that sounds like a fine idea to us! 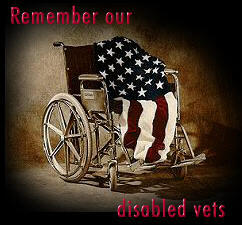 Please support these businesses they support Veterans! Many of them not only sold a ton of hearts for the Memorialbut were very creative in their heart displays! Nicks Family Restaurant, American Legion Post 118, Olde Towne Pizza, Maple Inn, Dom & Luigis Barber Shop and Quaker Steak & Lube all had their many hearts beautifully displayed and it warmed the heart just seeing them! Many many thanks to all who purchased a heart for the Memorial! 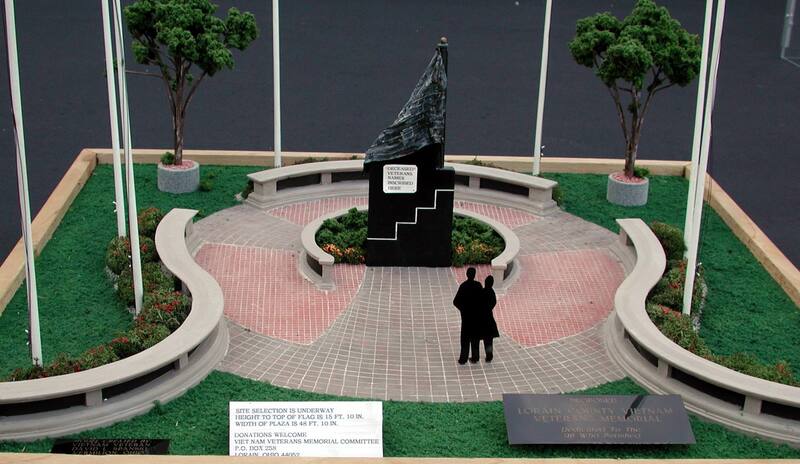 The scale model of the Memorial (constructed by our own Dave Spanski) became quite the traveler over the last year and a half as it made it's way around the county during local fairs, festivals and Fundraising events. Stay tuned for the location of it's next visit.... With your help we can get that backhoe to work and start on the real deal....then we can retire the model for good!